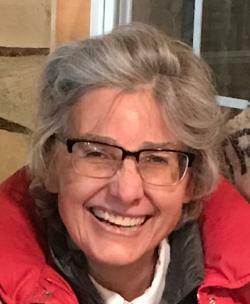 Vickey Sue Bell, 66, of Dawson Settlement passed away peacefully on April 13th, 2019 at the Moncton Hospital with her family by her side. She was born in Moncton on September 13, 1952 the daughter of the late Wallace and Margaret (Gabow) Steeves. Vickey was very personable and loved being around people. She and her husband, Lawson, owned and operated the Dutch Valley Bed & Breakfast in Sussex for several years where Vickey was able to show her hospitality to everyone that walked through their door. After moving to the Dawson Settlement area she worked at the Hopewell Rocks for a time and last worked at KENT Building Supplies as the Marketing Coordinator. She had a passion for working outdoors in her flower beds and landscaping; her rock walls and beautiful flowers were definitely a labour of love. She was a member of the St. Mary's Anglican Church. She had a beautiful alto voice and was a member of the Hillsborough Alumnae Choir and belonged to the music group Close Harmony who sang at many different functions to help raise money for several different charities and were well known in the area. Vickey had a great sense of humour and found her greatest joy in being with friends and family, especially her 7 siblings. She has left many fond memories and would want everyone to remember the good times they shared. She will be remembered for her kindness, caring and her unique ability to make people feel special. To live on in the hearts of those we love is not to die. Her legacy will be with us forever. She will be deeply missed by her husband and best friend, Lawson Bell of 33 years; her children, John David McKearin (Brenda) of Murray, Kentucky and Shannon Lorraine Richardson (Rob) of Moncton; her step- children, Emily Bell of Toronto, ON and Gordon Bell (Jena) of Ft McMurray, AB; her five precious grandchildren; sisters, Barbara Vibbert (James) of Washington State, Gloria Hassinger (George) of Virginia and Melody McNair (Charles) of Bath; brothers, William "Bill" Steeves (Sharon) of Mississauga, ON, David Steeves (Ida) of Albert Mines, Keith Steeves (Gisele) of Stoney Creek and Paul Steeves (Colleen) of Albert Mines. She will also be missed by many nieces, nephews and friends. The family will be meeting with relatives and friends at the Albert County Funeral Home for sharing of memories and to celebrate Vickey's life on Tuesday evening from 6-9pm. The funeral service will be held at the St. Mary's Anglican Church, Hillsborough on Wednesday, April 17th, 2019 at 11am with Rev. Rob Salloum officiating and Rev. Barbara Haire officiating. Following the service the family invite everyone to join them at the Hillsborough Legion for further sharing of memories and refreshments.